The great thing about buying a full set of cookware is that you get to start all over, fresh. All of your pan sins of the past can be erased, if not forgiven. 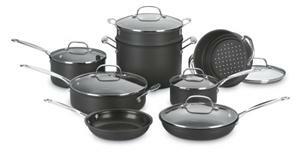 You open the big box and unwrap a whole set of matching pans and lids that are perfect and ready to go. If change can be difficult to consider, think about it as an upgrade. You'll reap the benefits of new designs and technology. The Cuisinart set is a wonderful choice for many reasons. The Quantanium interiors provide a superior nonstick surface. The pans and lids are constructed to be high performance, resistant to breakage, wear, and the adherence of food. The drip-free rims, stay-cool handles, and helper handle are small features you'll appreciate during your most hectic cooking days. The aluminum cores provide exceptional heat distribution. The set includes some extremely valuable pieces in addition to the traditional regulars. The pasta steamer insert and regular steamer insert are items not found in most sets. Buying the full set saves you on the cost of the pans and the hassle of trying to collect individual pans. Even if you don't display your set, you can be proud to have friends or family catch them out on the stove. Compare this with Cuisinart's 12-piece cookware set and see which pieces you really need.